Onion soup with a nicely browned cheese topping at the Barn Door. What a pleasure to live so close to a good restaurant with delicious food and convivial hosts. I live half a mile from the Barn Door and I eat here quite a bit. I can’t think of the last time I set foot inside any of the many restaurants that tried to make a go of it in this location over the years. One after another they opened, served awful food, and then shuttered. I thought that perhaps this piece of real estate was cursed and that any place that set up shop here would be doomed to fail. Voodoo? Santaria? Witchcraft? I am happy to report that there appears to be nothing paranormal about why other restaurants in this spot came and went. The answer is painfully mundane, the Barn Door is a popular place because the food is great and the decor tasteful. Somehow, the previous tenants failed to get the memo. This is not a cheap eats place. The reason I am including it in my column is that you can eat very well here and not spend a fortune. The secret is to order what is available on the happy hour menu or choose from the appetizers. I have conceived a favorite meal at The Barn Door. I order the mussels and ask for extra bread. An appetizer-sized order of mussels is a huge mountain of briny black bivalves served with a second large plate for the shells. I like mussels, although I rarely order them because they are often disappointing. They often look great and bountiful with the shiny indigo shells, but you are left picking around for a tiny pistachio-sized critter inside. I can honestly say that the mussels at the Barn Door are the best I ever had. You may choose a number of ways to order them, but I ask for the “house” style, which brings the mussels swimming in a pool of garlicky white wine sauce. The first-rate crusty bread on the side is used to soak up the juices. I am a rather prodigious eater and I can’t think of a time when I was able to finish the appetizer portion served. 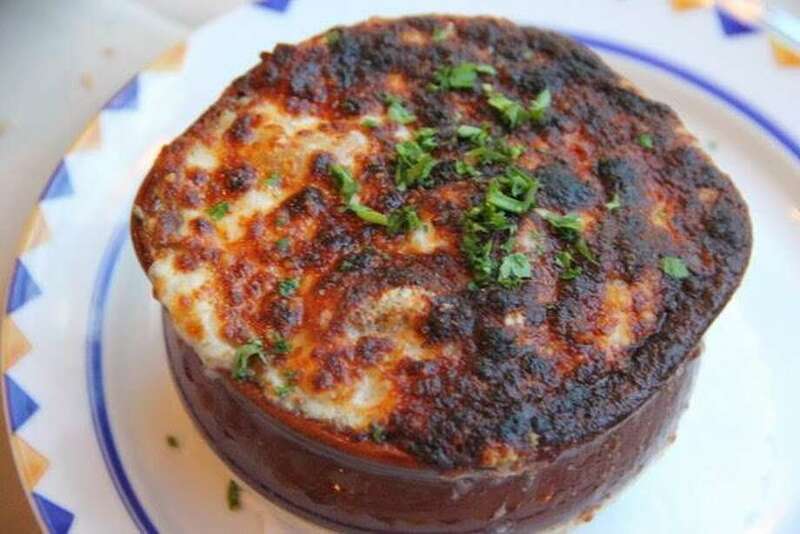 Another great way to cut cost is to get the cheese-encrusted French Onion Soup: a can’t-miss classic and a never-fail delight. Follow the soup with an appetizer of burrata with slices of roasted red pepper and prosciutto. Burrata looks like a hunk of mozzarella, but when you touch it with your fork, a swish of pure cream gushes out like a tiny cheesy volcano. Again, ask for extra bread and sop up the delicious tasty puddle. The eggplant stack is another good bar food item. You will get a tower of fried circles of eggplant intertwined with mozzarella and tomato. It is not a belly-bursting portion but certainly delicious. I have ordered this with a house Caesar Salad. As is the case at most restaurants you can jack up the salad with steak, chicken, shrimp or salmon. Recently I went with a friend for lunch at the Barn Door and she ordered the Caesar Salad topped with chicken. This seemed staggeringly boring to me. But when the salad came to the table I was jealous and wanted it for myself. A well-dressed anchovy spiked Caesar topped with a mound of charcoal-fired chicken. It was so delicious that I ignored all rules of dining manners and helped myself to forkfuls of her lunch. Fortunately, there was enough for both of us and enough for her to bring home what was left. Beside the good and price-worthy food here, I have to say a few words about the servers and staff. Rarely have I seen such an attractive, well-trained group. Young, pretty or handsome, their smiles are genuine and if you ask for a tweak or two for the dish you order, it will be greeted not with an eye roll but with an ebullience that makes you feel you are special and not annoying. The front of the house is a lovely tasteful bar. I have been here once or twice when it was so crowded I felt like I was on a rush hour subway in Tokyo. I don’t like a crush of people, so I asked if I could have a drink and a small bite in the main dining room. I was happily escorted to a table with lots of elbow room. Again, the good will here seems utterly genuine. I have finely tuned radar when it comes to that awful Disney-World-style fake cheer seen at places like the Cheesecake Factory; the friendliness at the Barn Door seems just right. I also have to give them credit for being one of the few restaurants left in Fairfield County that makes a Whiskey Sour correctly. This classic cocktail is culinarily dated, eclipsed by God-awful “craft cocktails” filled with a kitchen sink’s worth of bitters, elderflowers and discordant ingredients that no one has thought to put together before because they are as ridiculous as wearing overalls and a top hat. I like restaurants like the Barn Door that honor the classics like a great steak burger and a perfect Creme Brûlée, but also are open to creativity when there is a reason for it and not just to be “original.” I hope this place stays in business for years. Jane Stern, a Ridgefield resident, co-authored the popular “Roadfood” guidebook series with Michael Stern.